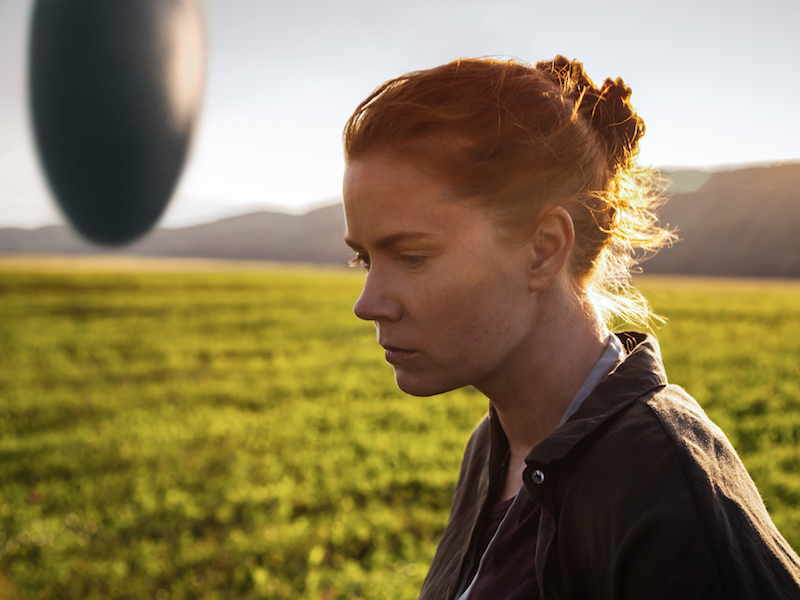 The new heady sci-fi feature Arrival is the kind of film that’s difficult to completely take in after the first sitting and having a solidified critical reaction to it in such a short amount of time seems like a bit of a fool’s errand. Having seen it a few nights prior to this writing and also having a couple days for post-viewing reflection, I imagine a second go-round almost seems essential to properly evaluate it but it’s difficult to say which elements would be enhanced or be diminished from repeat viewings. What I can say is that this is one massively ambitious and confident piece of filmmaking that will inevitably divide audiences as they wrestle for specific forms of meaning within the story. Amy Adams is profoundly affecting as Louise Banks, a linguistics professor who is called in by the US government to attempt communication with aliens aboard an extraterrestrial spacecraft that has mysteriously touched down in Montana. Joining her on the team is the cocky theoretical physicist Ian Donnelly (Jeremy Renner) and the critical Colonel Weber (Forest Whitaker), along with other members of the international scientific community who are simultaneously engaging the other eleven ships discovered in equally inexplicable locations across the globe. The remainder of the storyline revolves around Banks’ contact with the new visitors, as she attempts to learn why their ships are stationed at the seemingly random spots and why they have come to our planet in the first place. I’m obviously playing coy with some of the larger reveals around the plot, as they’re much better for viewers to discover on their own, but suffice it to say that details from Banks’ personal life soon intermingle with her job of decoding these foreign alien messages. The method of communication that they use, a form of circular drawings that is not only brilliantly conceived but visually stunning in its complexity, seems to suggest that these lifeforms have a perception of time that exceeds the ability of humans. When this concept is applied to the narrative, it creates a sort of non-linear chronology that may seem confusing in the moment but seems to click right into place right before the film’s conclusion. This is the fourth English language movie from French Canadian director Denis Villeneuve, who is responsible for last year’s excellent drug thriller Sicario, and it’s incredibly fulfilling to once again see his unique brand of challenging storytelling fused with a mid-budget, widely-distributed vehicle like this. He’s making the kind of creative leaps and bold narrative choices that someone like Christopher Nolan would incorporate in their films (yes, Arrival does have notes of Inception at its core) but he’s doing it with a fraction of the funds. Seeing him succeed so valiantly in the science-fiction genre is a comforting sign for those who are hotly anticipating his Blade Runner sequel next October, especially given how many franchise-extending films have disappointed in the past. I would be remiss to neglect the efforts of cinematographer Bradford Young, who also recently shot Selma and A Most Violent Year and is further proving himself to be one of the most visionary DPs working today. His camera is both pensive and personal in its scope; his ability to capture both moments of grandeur and intimacy with the same level of focus and beauty is nothing short of remarkable. At a time when most movies seem to track two steps behind the audience instead of two steps ahead, Arrival is a most welcome arrival indeed.